A water pressure switch device senses changes in pressure and responds at one or more actuation points by turning on or turning off the water supply, or by triggering an alarm. Most often used in connection with pumps, water pressure switches are capable of monitoring and regulating water pressure systems by engaging the pump unit when the pressure is too low and stopping the pump when the pressure is optimal. Among the styles of water pressure switches to choose from, standard plumbing systems usually use low pressure switches to keep the pressure between 30 psi and 50 psi, but many industrial applications, water jet cutting systems for example, require high pressure switches to maintain higher base pressures in order to exert between 40,000 psi and 100,000 psi. In high pressure application water pressure switches act both as a safety precaution to prevent overloads and explosions, and as a practical way to regulate the water supply. Water pressure switches can also be used to monitor and regulate industrial boilers, to control water levels, and to monitor wastewater in order to prevent overflow. Water pressure switches operate on the same principles as most other pressure switches: a small pressure-sensitive force collector such as a strain gauge, piston, diaphragm, bourdon tube or bellows receives strain from the pressurized water and acts as a transducer, generating a signal as a function of the imposed pressure. The switch is programmed to respond at certain actuation points along the pressure spectrum in order to manage the pressure system as specified. 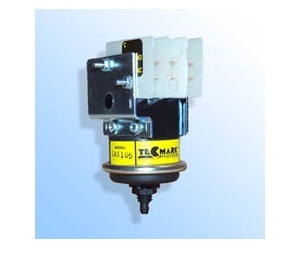 Pressure switches can be made of different materials depending on the specific type and application, but can include acetal, brass, silicon, bonded metal foil, ceramic, polycarbonate, plated steel, glass reinforced polyester, polyvinyl chloride or cast aluminum. Because they are designed to handle various water-based situations, they are useful for filters, wastewater applications, water treatment, hydraulics, pipelines, sumps, pumps, swimming pools and more. Water pressure switches are specifically designed for alarm, shutdown, and control of many different processes and types of equipment, and thus perform well in any instances in which measurement and regulation of water flow is required. The advance of pressure switch technology has made water pressure switches an integral part of making processes involving pressurized water safe and dependable. Some things to consider when looking for a water pressure switch are accuracy, pressure range, electrical output, gauge type, temperature compensation, temperature output and field adjustability. Water Pressure Switch A water pressure switch is a type of hydraulic pressure switch that measures and helps regulate changes in water pressure.